Focus Features will release the Downton Abbey movie on Friday, September 20, 2019 in North America and Universal Pictures International will release it on Friday, September 13, 2019 internationally. Commented Focus chairman Peter Kujawski about the release. "Since the series ended, fans of Downton have long been waiting for the Crawley family's next chapter. We're thrilled to join this incredible group of filmmakers, actors and craftspeople, led by Julian Fellowes and Gareth Neame, in bringing back the world of Downton to the big screen next September." 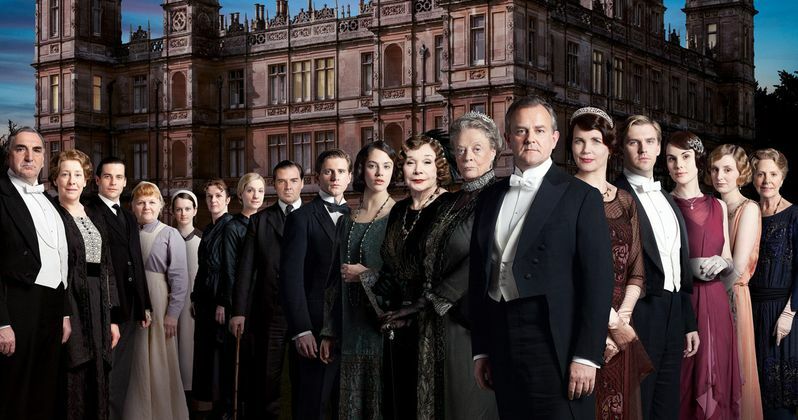 The Downton Abbey movie will star the original principal cast, including Hugh Bonneville, Laura Carmichael, Jim Carter, Brendan Coyle, Michelle Dockery, Kevin Doyle, Joanne Froggatt, Matthew Goode, Harry Hadden-Paton, Robert James-Collier, Allen Leech, Phyllis Logan, Elizabeth McGovern, Sophie McShera, Lesley Nicol, Penelope Wilton, and Academy-Award® winner Maggie Smith, as well as new cast members Academy-Award nominee Imelda Staunton, Geraldine James, Simon Jones, David Haig, Tuppence Middleton, Kate Phillips and Stephen Campbell Moore. Academy-Award winner Julian Fellowes who created Downton Abbey and wrote the film's screenplay will produce alongside Gareth Neame and Liz Trubridge. Michael Engler returns to direct. Brian Percival, who directed the series' pilot, will executive produce the movie alongside Nigel Marchant. Even though it is almost exactly a year away from release, Downton Abbey already has some competition on September 20. Warner Bros. will be launching The Kitchen on the same day. It follows the wives of New York gangsters in Hell's Kitchen in the 1970s, who continue to operate their husbands' rackets after they're all locked up in prison. The action crime drama stars Elisabeth Moss, Melissa McCarthy and Tiffany Haddish along with Domhnall Gleeson, James Badge Dale, Common and Margo Martindale. Also arriving on September 20 is Little from Universal Pictures. The story follows a woman who receives the chance to relive the life of her younger self, at a point when the pressures of adulthood become too much for her to bear. The movie stars Issa Rae of HBO's Insecure, along with Caleb Emery, Marsai Martin and JD McCrary. Focus Features announced the release date earlier today. the Downton Abbey movie began production at the end of August. Shooting will continue throughout the rest of the year.